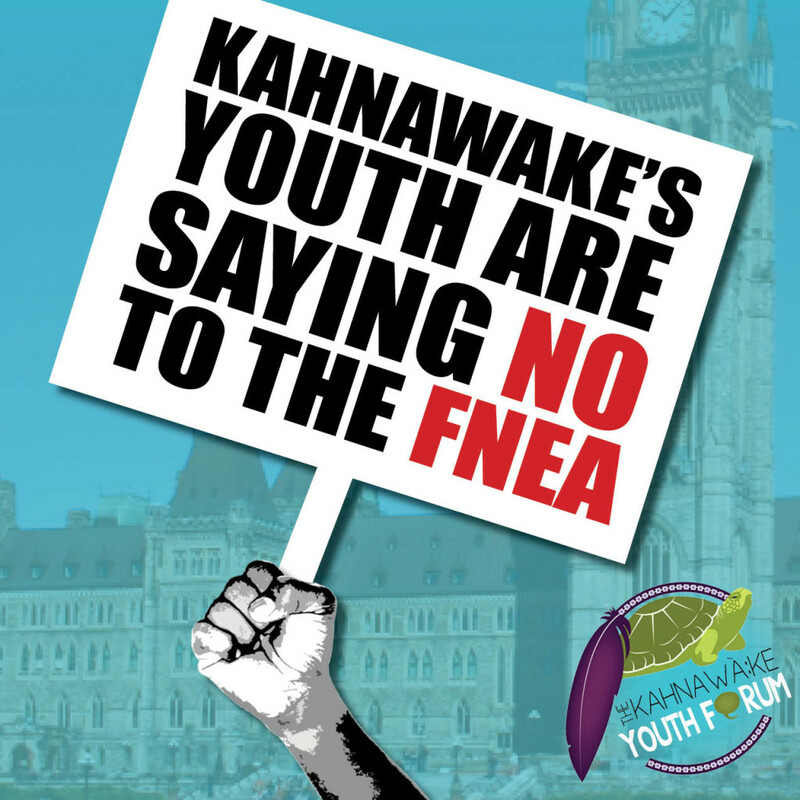 We, the executive committee of the Kahnawà:ke Youth Forum, are writing to express our concern for the proposed First Nation’s Education Act and to call on Canada to cease all actions related to the development, passage and implementation of this Act. As the youth of Kahnawà:ke , it is our responsibility to ensure that we are prepared to become the next generation of leaders and thinkers in our community and as a result to defend and guide the future of the subsequent generations of young Kanien’kehá:ka (the People of the Mohawk Nation). It is important to state that our philosophies, values and traditions are rooted and cultivated in the Kaianere’kó:wa (the Great Law); a worldview that is fundamentally different from a Canadian perspective and requires a unique set of educational, economic and political approaches to community development. To ensure that these community needs are met, our young Kanien’kehá:ka work to recognize, develop and implement the concepts of self-determination and sovereignty embedded in the Kahswéntha (Two Row Wampum); the symbolic agreement between the Kanien’kehá:ka and the settlers to govern themselves without interference. Our young Kanien’kehá:ka continue to develop and undergo a strong pedagogy and curriculum that addresses not only the cognitive, emotional, physical and social development of primary and secondary students but also matures a strong set of values, spirituality, and cultural identity relevant to the community of Kahnawà:ke. Our current education structures in the community are well developed, holistic and catered to needs specific to Kahnawà:ke, and the proposed act will not only abrogate access to resources that will meet our unique community needs, but will limit our forward progression as contributing members of society. The proposed First Nation’s Education Act interferes with our right to self-determination, an Inherent and Human Right of the Kanien’kehá:ka; the ‘Right to govern all affairs of Kahnawà:ke’ is recognized by the International Covenant on Civil and Political Rights – Article 1, and by the United Nations’ Declaration on the Rights of Indigenous Peoples. The proposed First Nation’s Education Act also interferes with our right to have access to proper education, which includes the implementation of concepts from the Kaianere’kó:wa, the Kanien’kehá language and the Kanien’kehá:ka culture, as well as abrogates our right to jurisdictional control of education. There is a lack of commitment for not only our language and culture, but also to nursery, kindergarten, and special needs services and supports. The proposed First Nation’s Education Act lacks a commitment for statutory funding requirements that are based on real cost and need, for adequate post-secondary funding continuation, and for cultural support centers—all of which are necessary to access proper education. As youth, it is important for us to have the opportunity to continue our education to develop and contribute to not only our community but also to society as a whole as well. The proposed First Nation’s Education Act is dangerously reminiscent of the ‘Indian Agents’ of our collective history. Although the youth of our generation have not experienced the process of residential schooling for themselves, it is important to state that we have been affected by intergenerational traumas and can recognize the harm caused by an external control of education in Indigenous communities. We regard the First Nation’s Education Act as contradictory to your, Stephen Harper, apology and commitments to reconciliation. The construction of proposed First Nation’s Education Act itself is in violation of the Duty to Consult, prescribed in the Canadian Constitution (1982), by unilaterally developing this law in isolation, with no consultation with the Kanien’kehá:ka of Kahnawà:ke. With all due respect, we, the executive committee of the Kahnawà:ke Youth Forum, demand that the federal government meet its obligations and take the steps necessary to meet with not only Kahnawà:ke, but to youth in particular who will be most affected by the implementation of this act, to discuss and aid to maintain the quality development of the Kahnawá:ke education system, respecting the Right of Kahnawà:ke to govern its own education system. Click here to view the signed letter addressed to Prime Minister Stephen Harper and Aboriginal Affairs Minister Bernard Valcourt.